Guys!!!! I cannot believe this pretty window is in my bathroom! It’s the first window moulding I’ve ever played with, so I’m pretty pumped! NO fancy boards to buy! Only standard schmandard straight cut wood anyone can get and do with any saw. 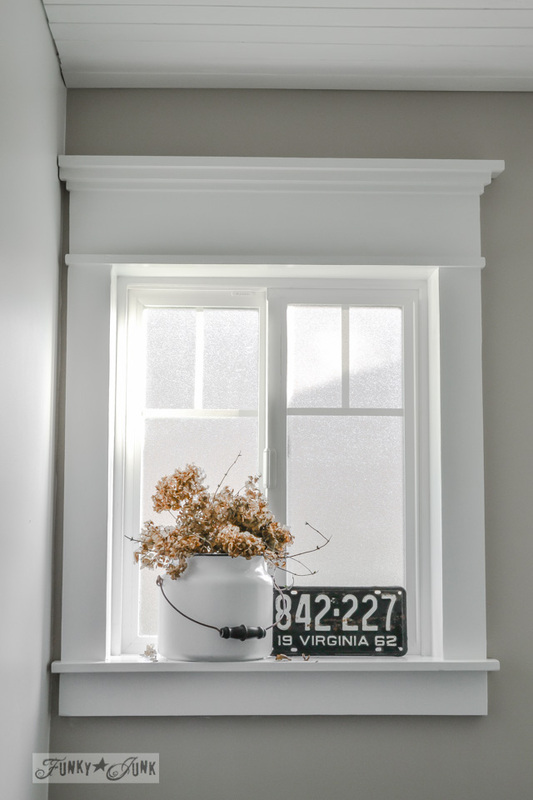 I grew up in an old, rambling farmhouse with massive old window moldings. And I’ve missed them ever since. I searched online how to do this, but came up with complicated tutorials with miter cuts and fancy board pieces. I wanted the easy button. Then I came across a variation that showcased a really easy way to achieve the look through normal planks. Hmmm…. All straight, boxy cuts. Perfection! So this is my twist of it! Note: prep the wood really well. I didn’t do enough sanding on mine so the mouldings don’t look ‘brand new’ in some areas. It’s kinda cool that way, but just a heads up you need to work this wood well for a brand new look. What’s up with these new windows having no decent window sills? Well, I wanted one. So after removing all the outside window moulding, I left everything inside the wall intact and worked over top. Did I mention I cheat where I can? I determined how wide (left to right) to make the window sill by measuring the two side casings in place. The sill was made slightly longer. Depth (front to back) was determined by how much I wanted the sill to stick out in front of each side casing. Since I didn’t have a board that was deep enough, I doubled up. This sounds complicated but it’s really not. It was just like building with blocks. The 1×2 is in the back and the 1 x 6 is in the front. 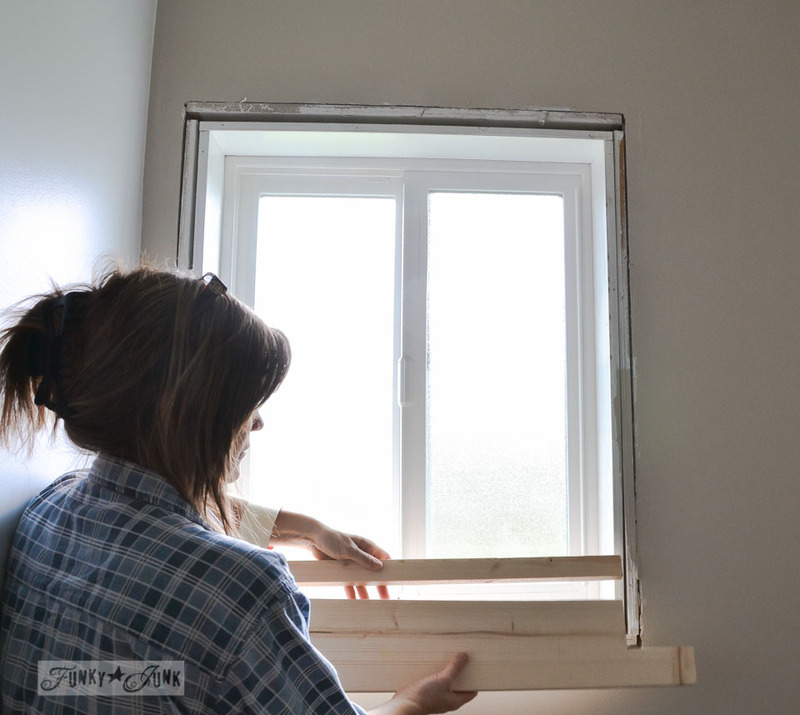 The 1 x 4s were cut to fit from the top of the window opening to sitting on the window sill. Adding the small 1 x 2 to the window sill pushed the sill out beyond the side casings. I wanted a beefy header without all the fancy miter cuts. So I layered square boards in place instead. The header was nailed together before installing on the wall. Tip: long ago my brother told me to search for kiln dried wood that was stored inside. Do that and the wood won’t warp on you. Cut the apron to match the width (left to right) of the two casings in place. 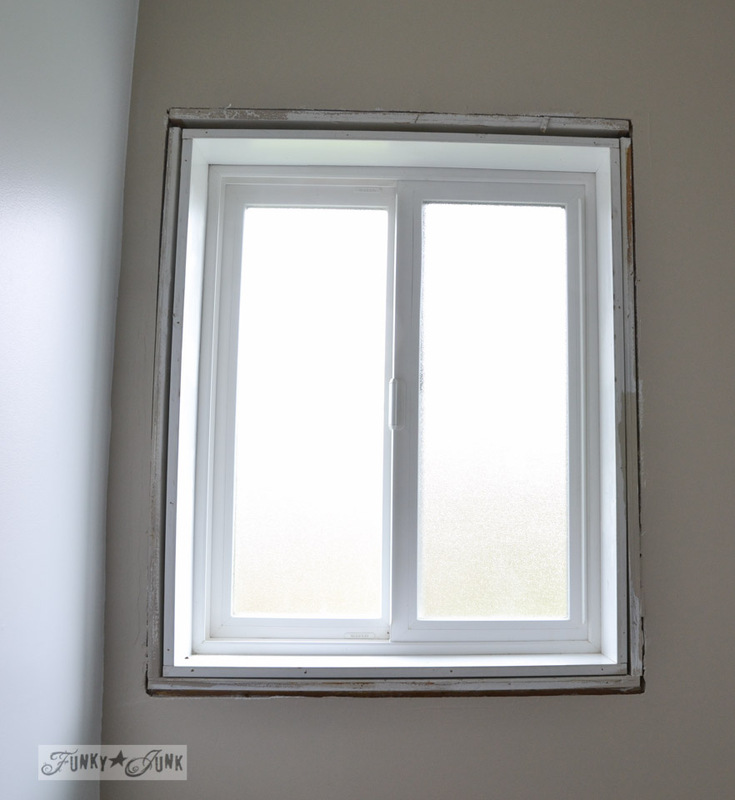 The window moulding was then primed and painted with semi gloss white. The mullions (white bars on glass) are pieces of white sign grade vinyl cut to size and stuck into place. This makes cleaning a breeze and opening/closing the window effortless. Think you might try one window? 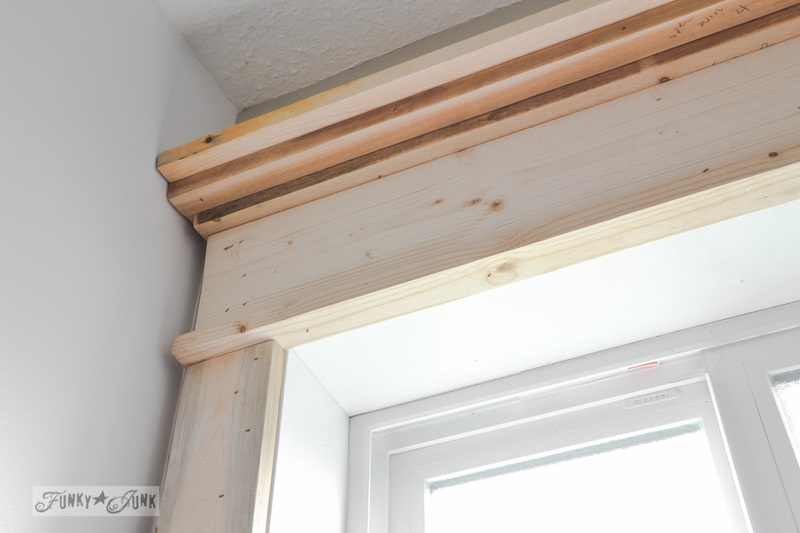 BRILLIANT- excellent way to make this effective window moulding without mitre cuts- stack the wood!!! The window just looks superb! It is fantastic. You have such an eye for creating beautiful vignettes. Love all Frenchified stuff out there, your window is just PERFECT! Thank you for this GREAT tutorial Donna. I’ve been wanting to do this but none of the blogs I saw gave so much detail and I just didn’t “get” exactly how to do it. Plus those darn miters. This will look awesome in my home. Wish I had more time! OMG the BEST tutorial!! !… I can do this too! This window looks A+ perfect Donna! Thanks for showing the world that they can do this too! This is gorgeous! I can’t wait to show this to my husband. He might want it for his office. Nice job! I love it and what a thrilling feeling to do something you’ve never done before and have it be a) exactly what you wanted, and b) absolutely beautiful! You are amazing. Very nice, and you made it simple too! I think I noticed a change to the ceiling too? Great job Donna! Simple isn’t it? If people only realized how super easy it is to do this kind of work!! ps Can you email me more details about the vinyl you used for the mullions? that’s on my list for this summer and I’d love to know your technique. Hi Anne! Sign grade vinyl is the kind of vinyl you can purchase from any sign shop in your area. It’s also the same material you get with any craft type cutter that makes decals. Even white contact sticky paper shelf liner whatever it is would work. Nothing fancy! Wow! you are an inspiration to me! I love this project! Excellent job and tutorial, as usual!! Beautiful addition to your bathroom. Love it and love the vinyl mullions! This is unbelievable…I think I could actually do this! It’s beautiful! Thanks for sharing, you’re so amazing! Love your new window! It looks fabulous! This is absolutely fantastic. And you did it yourself which ups the ante. Excellent job. Thanks Bliss! I have a thing… if I don’t do it myself, that means maybe someone else can’t either. Wowee–I absolutely adore this! We are working on a total house renovation for a 1910 house and this would work. I just found your amazing blog and I am so happy you are out there. Yikes! None. Maybe just go up as far as the arch? Sounds like you’d have to get something specially made. How high is the arch? If it’s a shallow arch, maybe you could ‘cover’ it with the header. Rachel may be onto something! Great idea! You can do exactly what Donna did on the sides and bottom, with a shaped arch on the top, made from a few pieces of wood. A picture is worth a thousand words, so I would need to post a photo to show it, please email me and I will make up a drawing that might help explain it better. Well, now that’s just brilliant! Absolutely brilliant, Donna! And so easy!!! Thank you, thank you! I live in an old farmhouse I am restoring and the windows are trimmed in 1×4’s. I’ve been wanting to dress them up at the top especially and was dreading dealing with crown molding, etc. This is much cheaper and easier and looks fantastic!!! The trim around the window in my bathroom has bugged me since I bought the house. It has a lot of mitered cuts that look like they were done by small children with hacksaws. I kid not! It is all pieced together, caulked and then painted…and looks horrid. I have been wanting to put up beadboard in the bath with a nice fat trim board on top. I have put it off because the window is in the way and I didn’t know how to deal with the window trim. Your tutorial is excellent. I think I can do this. I will probably not attempt until spring but definitely will do it. If all works well, I will do the trim around the door. Hmmm…maybe I should START with the door! Ohhhh I totally forgot about yours Julie! Isn’t getting old grand?! 🙂 Thanks for including your link for others! Absolutely beautiful. Job well done. But, we knew you could do it. Thanks for sharing. Can’t wait to see the other windows & doors! I love it. It came out beautiful! I also like the old container pictured. I have been looking for something to put my homemade laundry soap in and love old enamelware. I may have to find something like that to put it in. Great job, Donna! It inspires me to try more woodworking. This is really cute! I could do this! Just getting the hang of straight cuts, not ready to graduate to miter cuts! Donna: There is a whole lot to love about those moldings. Beautiful! Thanks! you laid it all out in a way I (a novice with tools and wood, but willing to learn)can understand and believe I can really do that! I’m remodeling a mobile home and need all the helpful hints I can get. This looks fantastic! 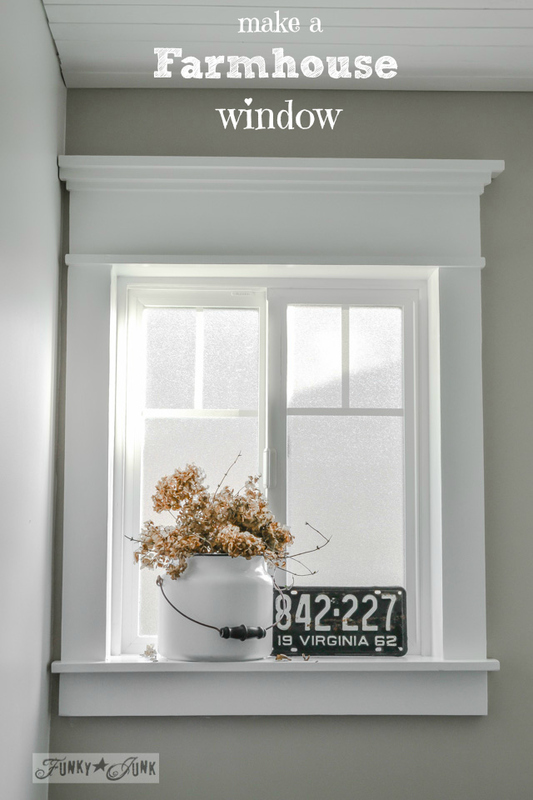 I love the moulding and the detail on the window with vinyl looks so good! I love it! And adding ‘mullions’ with vinyl is brilliant. It REALLY adds to the look. Bravo! Really looks great. Love your can-do attitude and see why you needed the nail gun working! YES! I’d love for my all my windows to look like that. This window sill is awesome!! I love this!!!! Love that window! Took it from drab to fab! Also love the color of your wall, what brand and color is it? Hey Dj! It’s by Cloverdale Paint in Canada, Bamboo Beach, cut in half. Full details of the entire new bathroom redo will be up at the end of next week! Stay tuned! Great Job! I’m going to try it! Thanks for sharing the how-to. I love your window, it’s beautiful!! Donna, it turned out fantastic! 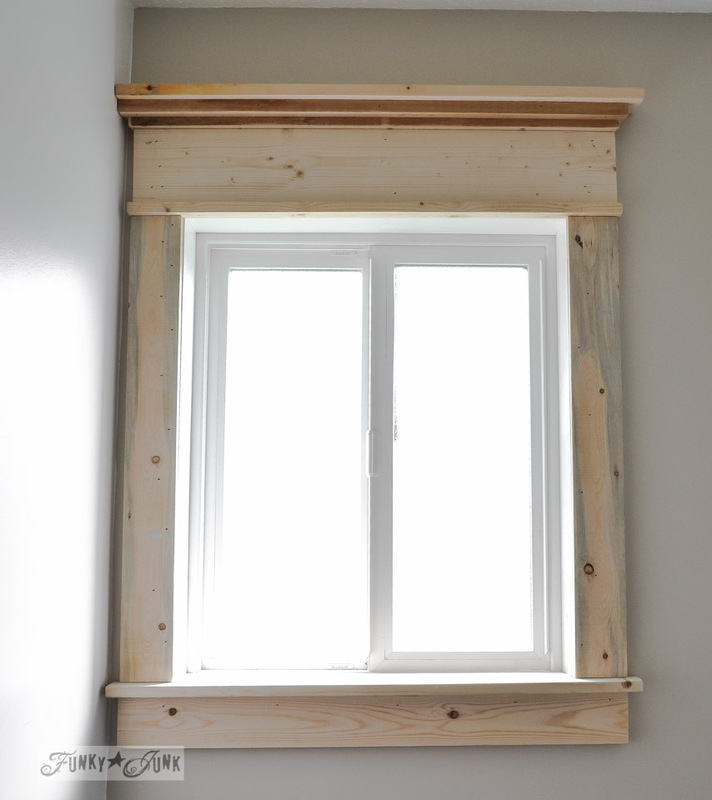 I went with simple farmhouse (no miter cuts) around my basement windows and I love them! Wow!! Great job, I love it. Such a talented lady. Your window is absolutely gorgeous! I love how it turned out and you make it look so easy to do. 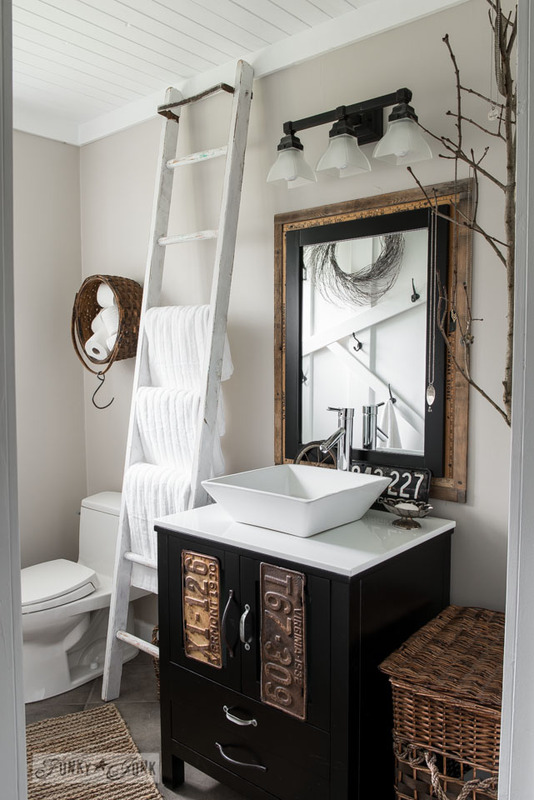 I may have to try this with my bathroom redo that’s currently a work in progress! I have plans to do all of the windows in my generally uninspiring mid 60’s raised bungalow. I think that may take a lot of time, but as my grandparents lived in a house with the same mouldings you had growing up, I want them too. To me, that’s what a house is supposed to be, and I would love to do my best to recreate it here. This is beautiful! And so simply done I might be able to do it too! Beautiful, Donna! You made it sound so simple. I want to do this on all our windows AND doorways. Dang it, what have you done?! Donna…love the molding and the grid in vinyl. Great tutorial! I love this look. I was just commenting to my husband that I wanted to make a beefy trim over our patio doors that haven’t had any trim for over 2 years. Once we replace the doors I’m going to do this! Thanks so much. Wow…so beautiful! Love that there are no miter cuts! I can see why you want every window in your house to look like this! Fabulous! It is absolutely beautiful! I’ve really missed being able to put my flower pots in windows because of the teeny tiny sills. NOW I have a solution. Next step, a jig saw and nail gun- watch out! Love this!!! You always do such a great job on the DIY’s. I want to do this for sure. These are gorgeous! 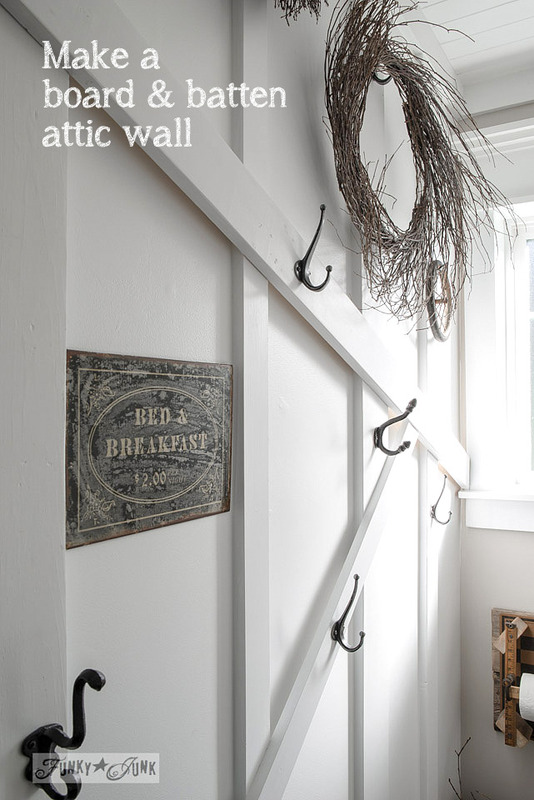 We live in an old farmhouse and these would really look nice…if I could get the husband on board. He likes the simpler projects. 🙂 Fantastic job! Wow! I never would have guessed that you window didn’t start out looking this awesome. You make doing this type of work look so easy! This turned out amazing, thanks for the step-by-step tutorial, very easy to understand! Now I’m going to hunt for a window to try this on! Wow, that is a huge difference. Thanks for the tutorial Donna, pinning it. Maybe some day I’ll drum up the courage to do it. WOW it looks amazing. You are so talented!! What a fabulous update, it is gorgeous! Wow Donna, you did an amazing job. I love how you made it so simple. Thanks for the tutorial, I may need it someday. I absolutely eat these molding posts up. What’s been particularly helpful to me is the side view of the header. That’s the first time I’ve seen that and it makes a lot clear. Thanks for taking the time to walk through your work. So glad the visual helped, Christine! I agree, you have a chance to do what you will actually like rather than just getting it done. Go for it! I love this! My washroom window looks just like yours. I think you’ve given me the courage to give this a go. Thanks for the inspiration! Your window looks beautiful. This is BRILLIANT DONNA ! Congratulations!!! This window molding is exactly what I have been looking for. I also ran into all the complicated miter cuts and details when I was looking. Then out of pure luck I found this site while looking at cheap window treatments on HGTV website. I LOVE THIS. I have been wanting to do something like this on the interior and exterior of my French doors, as well as all my windows. It may take me a while, but this is a definite TO DO top of the list. By the way, I think your way looks fabulous and just as professional as all the pro detailed moldings I have looked at. Wow! It looks great! What a perfect way to add character to a standard window. And you’re right, what’s up with the puny window sills nowadays!? Thank you so much for sharing this tutorial. I’ll definitely be using it. Thank you! Thank you! Thank you! I have been searching for a tutorial on how to add trim to my windows and a couple of entryways. I, like you, didn’t want all the miter cuts. I love this look and can’t wait to get started! 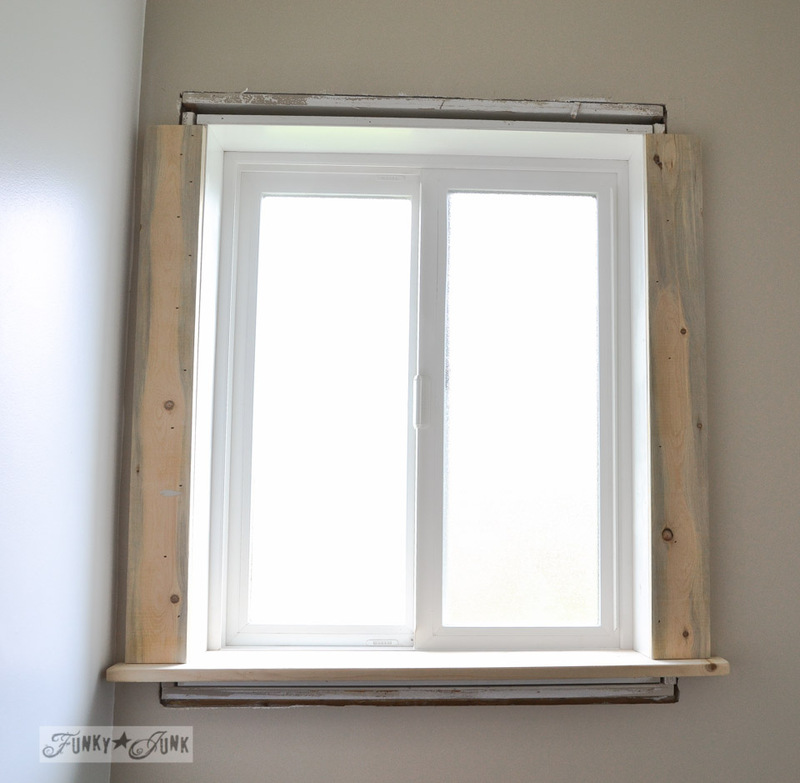 I have a farmhouse window that looks exactly like your naked “before” photo. Been waiting on hubs to do something with it. Now I’m inspired to do it myself!! Thanks. Beautiful job! YES!! That’s what I love to hear! You totally can do it Dixie! what size nail gun did you used?and do you think I can used a brad nail gun instead and did you use any glue? can’t wait to start.look so good. Hey Sharon, sorry I forgot to add those details in the post, I will edit! My nail gun is a Craftsman 16 gauge finish nailer. Nails were 1 ¾”. No glue! But lots of caulk and wood filler to finish things off nice before finishing paint. Amazing, wonderful, talented and oh so homey!!!! 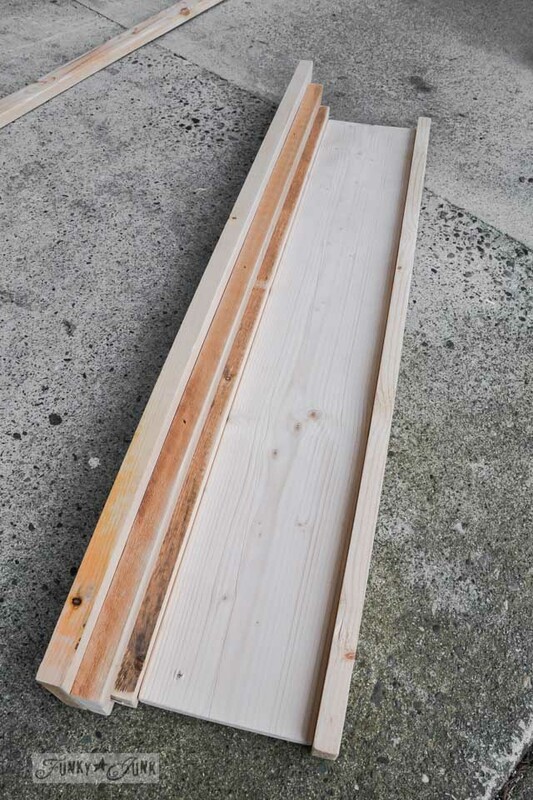 I like your ideas and would like to add a tip when using knotty wood for painted projects. Pre-prime knots with Kilz or shellac prior to prime and finish coats of paint. This will prevent the knot from bleeding through. Wow! This is very clever. Also thanks for the book reference. Going to check it out. Yes, that is lovely! I want to try doing these myself for my next DIY project. If you got time, I post up my own home tips on my blog at http://mouldmen.com – Thanks! Thanks so much for a great idea. We are doing a small bath remodel and this just might work! The mullions that you’ve ‘stuck into place’… is it on there with sheer tension or did you use something to apply it? I have 72″+ windows that have ZERO panes so they are very dull. want to add something to make it pop! Hi Morgan! I used sticky vinyl material, that signmakers use for lettering up vehicles. It has self adhesive on the back. Beautiful! I’ve been wanting to add fake mullions to my front windows for a bit of character, but didn’t know how “stickers” would look. . . so thanks for doing the experimenting for me. I think I’ll go for it! I LOVE THIS! I’m thinking of making a mantle myself and think that this approach would be awesome!! I would love to hire you to do this to my bathroom window, if you’re interested! I live in Chilliwack. Not sure if you do this sort of work for others or if you’d have time. Along with paying you, I’d be happy to bribe you with homemade, delicious chocolate cake! We’ve recently been renovating our bathroom, but now my husband has gone to work out of town and there are a couple things that he didn’t have time to finish (install the new light fixtures and trim the window!). He used your tutorial to install wooden planks on the ceiling. It looks awesome!! Thank you so much for not only sharing your ideas, but also how to do them. I just wish I were more handy with power tools and less of a chicken! hi. just framed my french doors using your farmhouse window instructions. looks great! love your site. I love how the casing is flush without a reveal. I would also like to do that in my windows but I have been told the reveal on the casing helps if the wood shifts over time. Have you had any shifting or cracking? Builder-grade in my area have absolutely no trim at all. I think I will follow your example to change my nondescript windows in my master bath into something special. Since it is a bathroom I will be sure to prime all the wood (all sides) before nailing into place. I want to protect the wood from the moisture. How did you stick the vinyl on the glass? I love this idea!! Hi Karen! I hand cut the vinyl right on the sheet using a ruler, then lifted it and did it by eye. It was easy! I’m in love with this. Can you tell me what the cost was to do this (Not including tools? Hey Carrie! 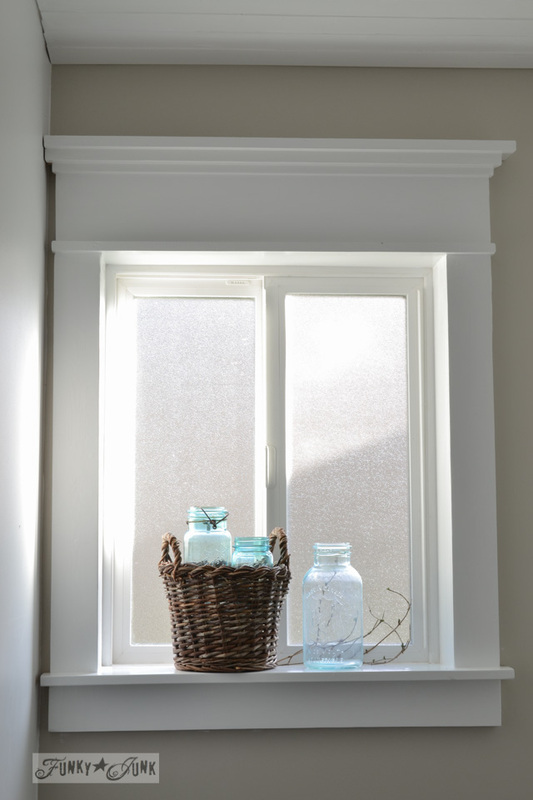 It all depends if you purchase your wood already primed and the size of your window. My best guess may be $25ish for what you see here. Oh my gosh Jennifer… it’s like my window walked into your house! It’s so amazing! haha I’d love to feature your window along with mine on either my blog or FB with a link and a picture of yours, are you ok with that? I’m seriously thrilled about this! You’re so sweet! I would love that, thank you so much! Wow what a beautiful difference. This looks amazing, and your tutorial is so helpful, thank you! I just might get brave and try this in my own home! Jesse, just remember, filler is your best friend. 😉 You’ll love the result! Sharp! I’ve mitered. I won’t ever do that again! Thank you for the tutorial! Hi Sabrina, sorry for my delay in answering your question! I layered the overhang… ¼”, ½”, ¾” on each side. But seriously? I’d just do it by eye. I didn’t use any special math to accomplish the look. my name is Erika and my house is in the middle of germany. I`m so happy to found your verry, verry pretty side. Ijust make a guest-room and your projekts are so beautiful and I love it too so much. The project how to make a easy window has my heard to make bumm bumm. On easter I will look more from your side, and I am happy about this. Please excuse my very bad English. I learnd it ia school about 35 jears ago. Aww, thanks for the lovely message Erika! I truly hope you make the window, because I know how much you will LOVE it! The before and after picture of the window makes it hard to believe it was the same window. I love the big moldings, and the shelf that you created for the vase and license plate. I would love to do this for all of the windows in my living room, and I’m so happy that you found the easy way out of it. Doing all of those complicated cuts, and getting those fancy boards just isn’t doable for me. Absolutely perfect! I want this on every window in my house. My husband is against the idea because he is concerned that if I paint the window (currently stained wood) to match the trim, they will stick and be hard/impossible to open. Any tips on painting windows to avoid sticking? Hi Erin! Try waxing the window with the side of a candle. Bet that would work! THANK YOU SO MUCH!! This has transformed my awful bathroom window, and we haven’t even painted it yet–I adore it now and want to go through our entire house window by window! 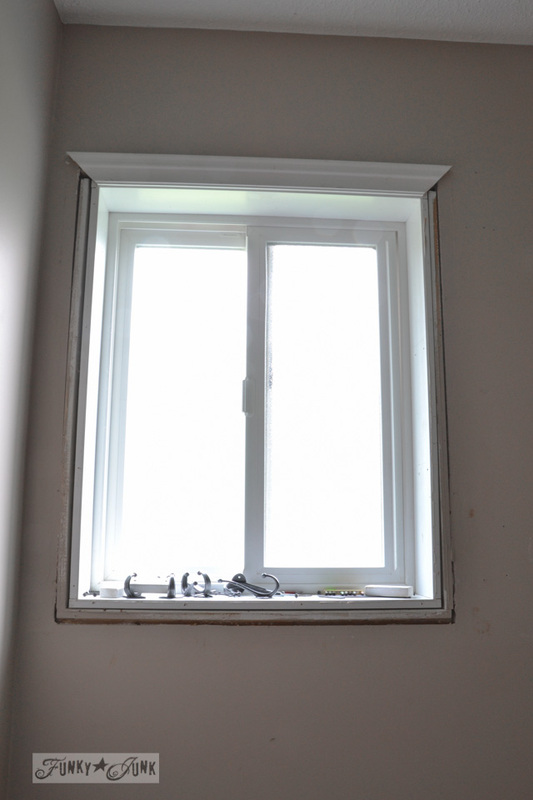 We bought a place with very small windows and somehow this trim makes it seem bigger which is SUCH good news for me. Plus, it being an 80s ranch, and me having wanted a 1880’s farmhouse, well…it’s probably as close as I’ll get for a while. Kudos to you on the bathroom window re-do! It is so simple and simply beautiful. Just goes to show that something does not have to be complicated to be enjoyable. Thanks for posting this. Thanks Richard! I’m still rather surprised I did this myself! haha Yes, it’s that easy! Your window is beautiful, It looks like it’s right out of a farmhouse. I love what you did to the glass also! I’m doing all the windows in my house. They had very cheap and skinny moulding and hardly any sill. So I got two really long windows and two doors done yesterday. What a difference. I left off the top boards that made the crown for a simpler look. I got the nailer that you suggested and it was great. Thank you for inspiring me. I am so happy to hear this Jayne! I just did a doorway too (tutorial coming soon!) and it’s gorgeous! Thrilled for your new, improved farmhouse look! ill use this idea using pallet wood. My husband and I purchased all of the wood to do this for 2 windows in our family room. It looks like you painted the trim after installing it. Would you suggest that, or painting before the installation? I was planning on using my purdy brushes. Did you do anything special so it didn’t drip? Thank you for your help; I love you window trim and tutorial! To avoid drips, I just don’t load the brush too much. A little at a time. Glad you like the window! It is SO EASY to do, and changes the feel for your entire room dramatically! 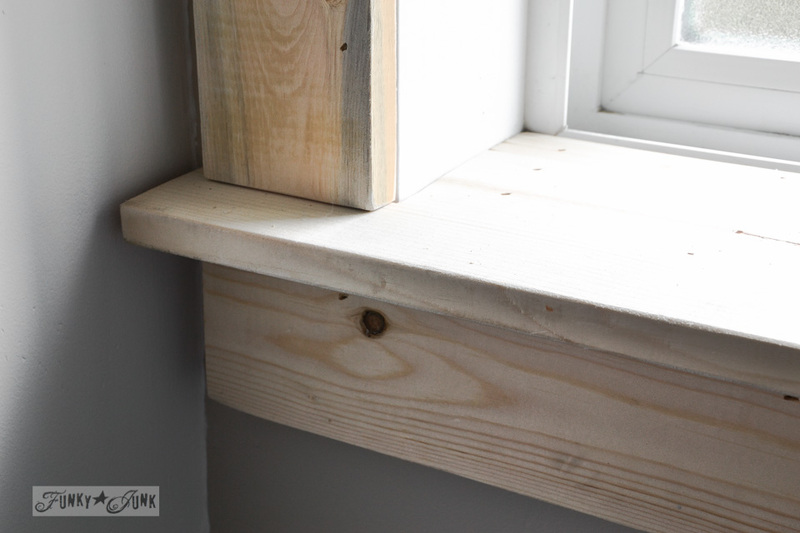 I’m trying to do my first window and I was wondering what kind of saw you used to get the angled cut in the window sill. I’m having a hard time with that and getting the measurements just perfect. I was thinking of making a template with a big piece of cardboard. Any tips would be appreciated and thank you! Hi Carrie, a template is a great idea! I just used a jig saw and made two cuts. Very easy! Well, I built my windows last week and they turned out AMAZING!!!!! I bought a new jig saw and it made everything soooo much easier than trying to cut the sills with a miter saw. Then, I got home and was looking at the websites (this is a second home of ours) and realized that I put a 1×6 for the apron instead of a 1×4. I also have the 1×6 for the header along with all the other trim pieces. Whoops. Do you think this is going to be okay or should I remove the 1×6 and put a 1×4 on the apron.? Hi Carrie, first off, good for you! I’m so glad you’re going for it and it’s working! As for the apron, if you like the look, why not leave it? As long as it doesn’t make the window too ‘bottom heavy’… it may be a personal preference thing. 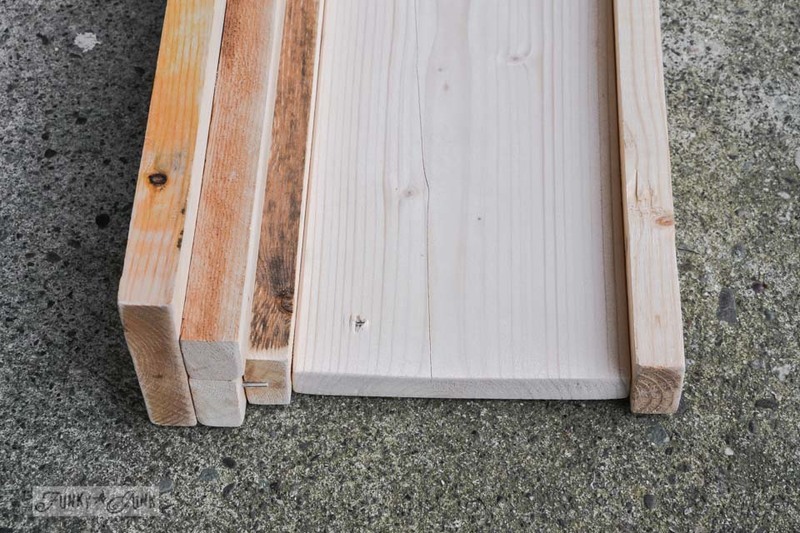 You could prime and paint the wood before installing. After installation touch up nail holes and apply final coat of paint. Much easier to paint boards while flat and saves time on painting. Great idea, Dinah! Although caulking is still mandatory, which then leads to a last coat of paint. I honestly found using preprimed boards the easiest way, the finish on the boards was much smoother than starting from scratch. More expensive though. Thank you for your post. 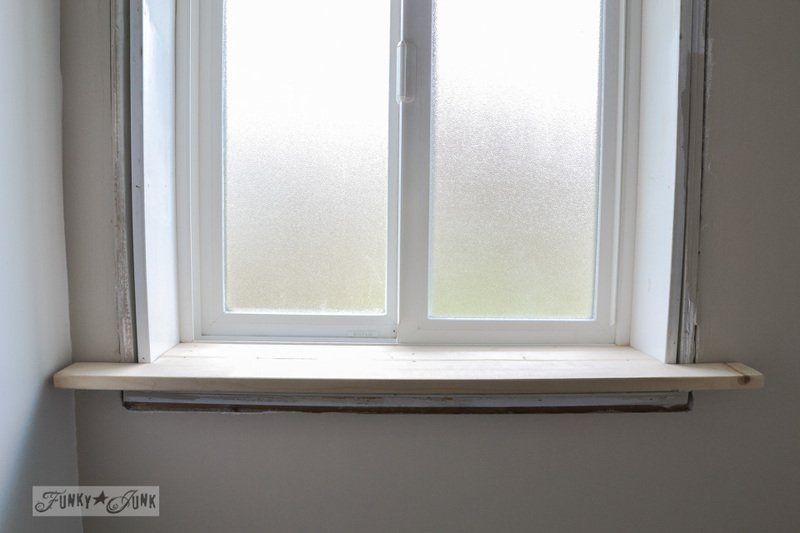 I recently did our bathroom window using your instructions, with just a couple of size modifications, and it looks fantastic! Many, many thanks. Oh, my goodness! I do hope you monitor your site so you can know how much I appreciate having found it! 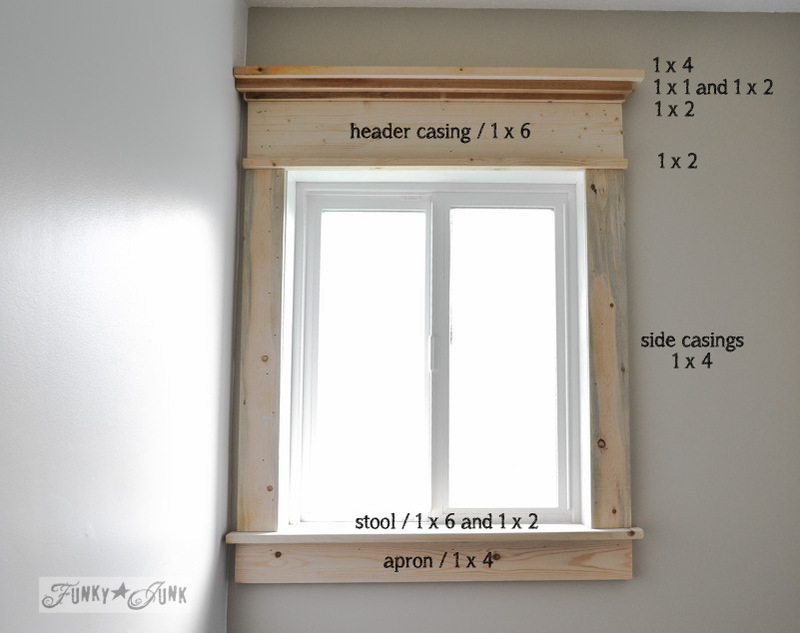 I have been scouring the web looking for instructions to case a window tastefully but something that I can do, something that shows specifically, step by step what I need to do. Here you are and I’m very grateful. Thank you! Thanks so much for all the great pictures! It really helps me to visualize the project. You are most welcome Bethany! I’m sure your windows will turn out super successful! This is one of my most copied projects to date, and every one looks so good! I will do this in every room in my home. Tutorial is very detailed,and easy to follow. You will LOVE the outcome! My fav tip is to use pre primed lumber if you can. More costly, however the pro outcome is so worth it! I’m still not sure how you put the white bars in the farm house window. I hand cut some white sign making vinyl material into strips and stuck it on. You could achieve the same thing with white contact shelving material. Love this look and am copying it for my home as it is the perfect look that I have been searching for. Not finding 1×1 wood though so may have to improvise. Thank you so much for this post and the great instructions as well as good photos. 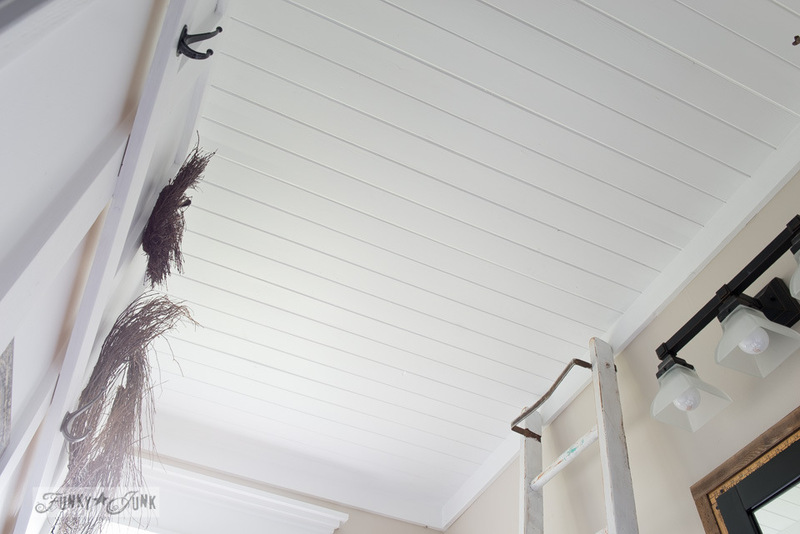 So glad you found this wood trim inspiring Carla! You are going to LOVE the results! Thank you for this wonderful inspiration! I love the square layered look and the stock pine used! It takes a lot of creativity to build the look you want with a simpler method using cost effective and readily available wood!! Thank you so much for this tutorial. I just finished my farmhouse window and absolutely LOVE it. I could not have done it without your instructions. Nice work, just a point you might consider. 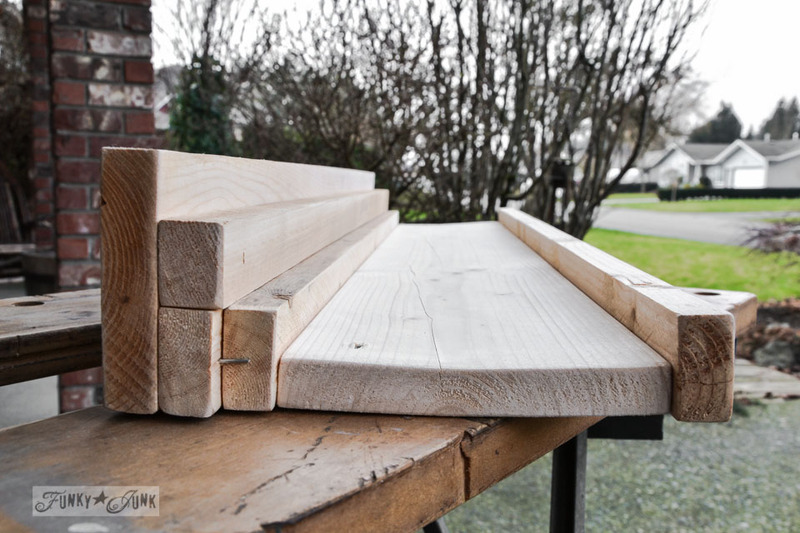 The sill instead of using 2 pieces just use a 1×8 it will measure 71/2″ just about the same but you won’t have a seam to deal with. Second on the header instead of doubling the second tear you can go with first a 1×2, second a 1×3 and the top a 1×4 that gives you an even 3/4 inch step on all three. You did great for a first timer. Keep up the good work and you have the home of your dreams! I did this to my master bath window and it became the focal point of the entire bathroom renovation. The only power saw I own is a jig saw and it worked just fine for this project. Thanks so much for the tutorial.